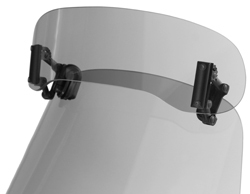 Adjustable Spoiler with clamps - designed for 265mm/10.4" minimum width screens. 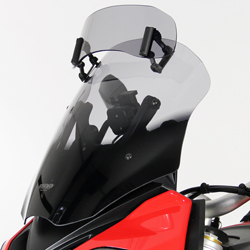 Where no complete MRA adjustable screen has been produced for your bike (see list of bikes here), the X-creen Sport universal windshield spoiler can be added and adjusted to almost any desired position to help improve the airflow at the top of your existing screen. 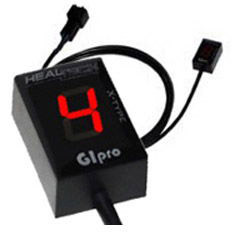 This product has been specifically designed to enable an MRA spoiler to be mounted on sports bikes or other bikes which have smaller/narrower screens and where the riders head is relatively close to the screen. If you have a bike with a larger more upright screen - and/or where your head is further away - we would recommend looking at our XCTA Touring version. 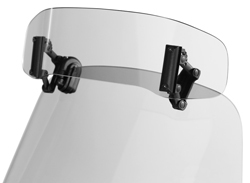 The MRA XCSA Spoiler can either be clamped to the top of your existing windshield using the included fittings, or bolted through your screen for a more permanent solution (parts and drilling template included). If you require a larger spoiler, please see the X-Creen Touring XCTA version. 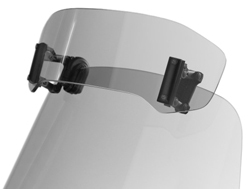 "...Just want to say I was VERY impressed with the little flip spoiler screen - excellent product. ...worked flawlessly for 2000 miles and at speeds over 150 mph [on trip from UK to Barcelona and back]." 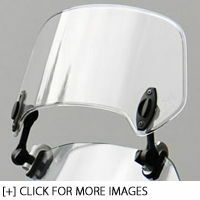 !quote, 59189, 59188, screens, extender, extension, extended, vta, spare, spares, xcreen, xscreen, x-screen, screen, windshield, fairing, spoiler, deflector, visor, vario, flip, aerofoil, aerotrim, aero-trim, aero, trim, deflector, laminar, lip, 4s, 6.5, 8v, 12s, 50, 53, 100, 110, 120, 125, 125dd, 125sp, 150, 180, 185, 200, 200, 225, 250, 250r, 300, 300I, 300r, 305, 350, 360, 380, 400, 400yp, 426, 450, 500, 500ie, 500I, 500s, 500xp, 504, 525, 530, 550, 550s, 570, 600, 600s, 600z, 620, 625, 636, 636r, 640, 644, 650, 660, 660r, 664, 675, 690, 695, 700, 700I, 748, 749, 750, 750z, 800, 850, 851, 865, 883, 888, 900, 906, 907, 916, 920, 950, 955, 955i, 990, 996, 998, 999, 1000, 1050, 1098, 1100, 1100s, 1200, 1200s, 1200se, 1250, 1250s, 1250sa, 1300, 1400, 1500, 1600, 1700, 1800, 1050st, 749r, 750ss, 900ss, adventure, africa twin, agility, agusta, an, an125, an200, an250, an400, an650, aprilia, atlantic, bajaj, bandit, bellagio, beverly, beverley, bmw, bold, bro, burgman, bws, bws12s, c600, c600gt, c650, c650gt, c1500, california, can am, can-am, canam, canarby, caponord, cb, cb400, cb400sb, cb500x, cb750, cb1300, cb1300s, cb1300st, cbf, cbf600s, cbf1000, cbf1000f, cbr, cbr125r, cbr250rr, cbr600f, cbr600rr, cbr1000rr, city, citycom, classic, cn250, country, crf1000l, cross, crossroads, cross roads, crossrunner, crosstourer, daelim, davidson, daytona, deauville, deluxe, dink, discover, diversion, dl650, dl1000, d'or, dor, ds, ds620, ds800, ds1100, ds1100s, downtown, down town, ducati, dylan, electra, electraglide, ely, elystar, er6f, er-6f, etv, etv1000, evo, explorer, exup, f650gs, f700gs, f800gs, f800gt, f800r, f800s, f800st, fazer, fes, fes125, fi, fiddle, fivestars, five stars, fj1200, fjr, fjr1300, fld, flhrs, flhtk, flhx, flstc, foresight, forza, freewing, fuoco, fusion, fz1, fz6r, fz600s, fz8, fzr, fzr1000, fzs, fzs600, geopolis, gilera, gl, gl1500, gl1800, glide, gp, gp800, gpz, gpz500, gpz500s, gpz600, gpz600r, grand, grizzy, gs, gsf, gsf600s, gsf650s, gsf1200s, gsf1250sa, gsx, gsx650f, gsx1250fa, gsxr, gsx-r600, gsxr600, gsxr600z, gsx-r600z, gsxr750, gsx-r750, gsxr750z, gsx-r750, gsxr1300, gsx-r1300, gt, gt50, gt125, gt200, gt1050, gtl, gtr, gtr1400, gtv, gtv125, gtv250, gtv300, gts, gts125, gts250, gts300, gts500, ggts1000, uzzi, gw, gw250, harley, harley-davidson, harleydavidson, hayabusa, helix, heritage, honda, hyosung, ie, iii. inazuma, insignio, integra, jackpot, jonway, joymax, joyride, k1200, k1200gt, k1200r, k1200rs, k1200s, k1300r, k1300s, k1600, k1600gt, k1600gtl, k50, k75, k75rt, k75lt, k100rt, k100lt, k-xct, kawasaki, king, klr, klr650, klv, klv1000, ktm, kwangyang, kymco, LML, lx50, lx125, lx150, madison, majesty, malaguti, max, maxsym, metropolis, moto, montauk, moto guzzi, motoguzzi, mp3, ms3, mts1200, multistrada, mv, myroad, nc700s, nexus, ninja, ninja-650, nr750, nss, nss250, nss300, nt650, nt650v, ntv, ntv700, ntx, pan, european, pan-european, pantheon, password, pcx, pcx125, pcx150, people, peoples, peugeot, piaggio, platina, polaris, predator, r100r, r1100, r1100gs, r1100r, r1100rt, r1100s, r1150, r1150gs, r1150r, r1150rt, r1200, r1200c, r1200gs, r1200r, r1200rt, r1200s, r850, r850gs, rc45, road, roadking, roads, roadster, rocket, rs, rt, runner, rvf750, s2, s3, s50, s125, s200, s300, satelis, scarabeo, s-wing, sento, ses, ses125, seven fifty, sh125, sh150, sh300, silverwing, silver wing, sixteen, sp, spazio, spider, spider max, spider-max, sport, sprint, spyder, sq, sq125, sr, srmax, srv, srv850, ss299st, st1050, st1100, st1300, st1300x, stx1300, st2, st4, ST700I, star, stelvio, street, streetglide, super, suzuki, sv125, sv1000s, sv650s, switchback, swt, sw-t400, swt 400, sym, symphony, tauris, tdm, tdm900, tiger, t-max, tmax, tour, tourer, touring, transalp, triumph, trophy, UH200, vectrix, vision, vl1500, vstrom, v-strom, varadero, vespa, versys, vespa, vfr, vfr800x, vfr1200, vfr1200f, vfr1200x, victory, victory-polaris, vision, v-max, vmax, vmax1200, v-max1200, vmx1200, vn1700, vp125r, voyager, vx-1, vx1, w800, x7, x8, x9, x10, x-city, xcity, xciting, xevo, xj6, xj600f, xj600, xj750, xj750f, xj900, xj900s, xjr, xjr1300, xjr1200, xlv, xlv600, xlv650, xlv750, xl1000v, x-max, xmas, xp500, xrv750, xt, xt660r, xz, xz550s, yager, yamaha, yp250r, yp, yzf-r1, yzfr1, yzfr6, yzf-r6, z750s, z1000sx, zr7s, zx, zx10, zx-10r, zx10r, zx250r, zx300r, zx-14r, zx14r, zx-6r, zx6r, zx636, zx636r, zzr, zzr1200, zzr1400, 10, 11, 12, 50, 53, 69, 70, 71, 72, 73, 74, 75, 76, 77, 78, 79, 80, 81, 82, 83, 85, 86, 87, 88, 89, 91, 92, 93, 94, 95, 96, 97, 98, 99, 1969, 1970, 1971, 1972, 1973, 1974, 1975, 1977, 1978, 1979, 1980, 1981, 1982, 1983, 1984, 1985, 1986, 1987, 1988, 1989, 1991, 1992, 1993, 1994, 1995, 1996, 1997, 1998, 1999, 2000, 2001, 2002, 2003, 2004, 2005, 2006, 2007, 2008, 2009, 2010, 2011, 2012, 2013, 2014, 2015, 2016, 2017, 2018, 2019, 2020 ! The product does help a lot, obviously you won't stop all buffeting but I would recommend this. The instructions are not fantastic, but there are videos online explaining how to assembly and fix. I have the spoiler at the same angle as my screen and it keeps the wind off at motorway speeds. 10/10.